43. Hatcher, John Trevor. Laurence Binyon: Poet, Scholar of East and West. Oxford: Clarendon, 1995. Hatcher rightly notes that Binyon’s was among ‘most benign and quietly influential voices of the early twentieth century’, and this careful biography offers by far the most compelling source of information of his life. Several chapters are directly of relevance to this study. 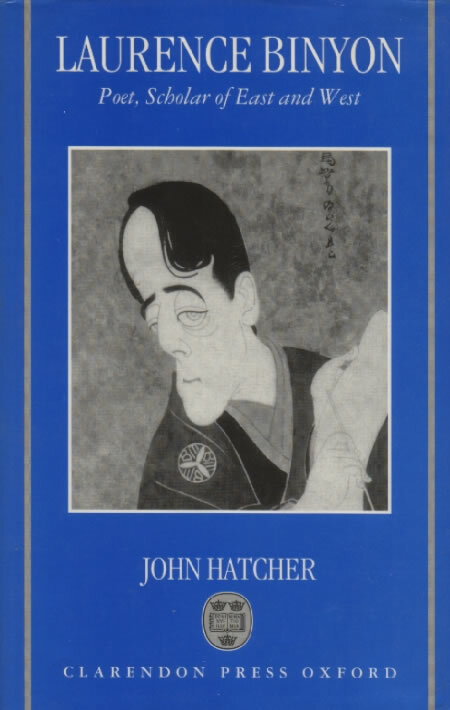 ‘Images of the Floating World’ traces Binyon’s history of acquaintance with Japanese art; ‘London Visions’ is insightful about connections between Binyon’s work with Japanese art and his early poetry; ‘Adam’s Dream’ details the experiments with anti-realistic drama by Binyon, Craig (see D17), Sturge Moore (CA9), and Yeats, in the days before Yeats’s experiments with the nô; ‘The Generation Gap’ includes details of Binyon’s relation with Pound; and ‘East and West’ reconstructs Binyon’s sojourn to Japan. Includes details of Binyon’s relation with Blunden, Bottomley (see CA3), Craig (D17), Eliot (CA10), Fenollosa (D10), Ralph Hodgson (Ap), Kohitsu Ryônin (see 2), Masefield (CA5), Moore (CA9), Noguchi (D15), Sansom (D22), Waley (D26), Yashiro Yukio (Ap), and Yeats, along with useful bibliography of both primary and secondary materials. Largely incorporates ‘Laurence Binyon: A Critical Biography’, PhD thesis, Oxford University, 1991. See also 33.